This vintage Diane von Furstenberg shirt is 100% cotton. It has wide stripes in dark pink and thinner stripes in medium blue, white, lavender, aqua-green, and black. 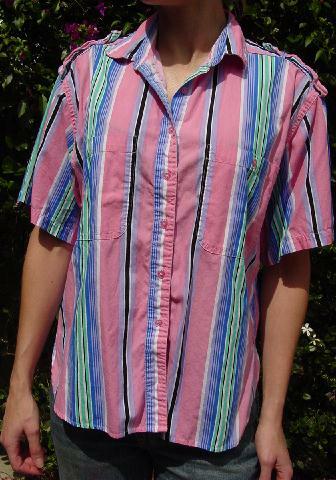 It has short sleeves, a shirt collar, and 7 iridescent pink buttons down the front. 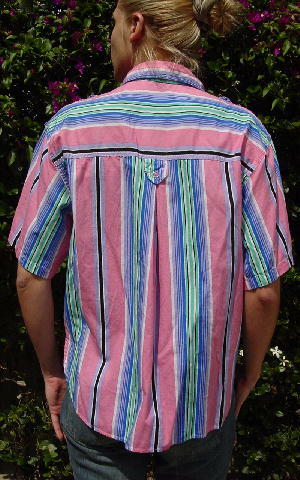 There are two large open breast pockets with one button closures, and it has a rounded shirt tail. It has a one button epaulet on each shoulder. The back has a yoke with a one button tab below it and an open dart extending downward below the tab. shoulder to shoulder 19 1/2"
shoulder to end of sleeve 9 1/4"
armpit to armpit 21 3/4"